THE LAST CHANCE TO SAVE GAUL! The Gauls were a people with a remarkably sophisticated civilisation and tradition as warriors and craftsmen, but fiercely resistant toward having a ruler at beyond the tribal level. Which made them easy pickings against an ambitious Julius Caesar, backed by Rome's need for constant conquest. Though his father Celtillus had been killed by his own people for trying to unify the tribes under his command, his son negotiated, inspired, made alliances, and finally took on the traditional title of "supreme warlord" that his father had died reaching for. The title was "Vercingetorix", and he bore the title so well that people today think of it as his name (which we do not even know). But then, no Gaul ever bore the title again. Maybe you can change that. Vercingetorix: Twilight of the Gauls is a new game by designer Richard Berg that challenges players to unify Gaul, in around the 1st Century B.C.E. The Romans and Germans are not active players, but introduced with random and temporary control to interfere with active player intentions. Players draw chits each turn to improve their holdings, begin campaigns, obtain more tribal allies, or gain surprising "Opportunity" chits that allow them to interfere with other players' turns, launch revolts, and elevate player esteem. The choice is yours. 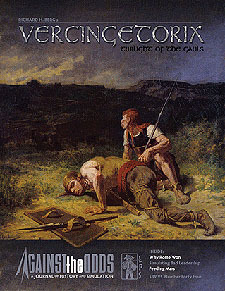 Can you save Gaul and make the "Vercingetorix" title your own?